Such was the chagrined email I received from the leader of our weekly Bible study. The night before, after our study time, we opened up the floor for prayer requests. We prayed for a niece’s surgery. We prayed for the well-being and safekeeping of children. We asked for comfort for a friend facing the illness of his beloved dog. Here’s what we did not do: we did not thank God for the miraculous healing He brought to our friend J., who had recently had extensive, complicated surgery. We remembered to pray for God’s intercession in our lives, the lives of our children, even the lives of our pets. But we forgot to praise and thank the God who was healing our friend, prompting our leader’s self-flagellating morning-after email. Why is it so easy to focus on today’s pain and troubles and forget to be thankful for prayers God has already answered? Why I am quick to catalogue my requests for God’s intercession, but slow to give thanks for what He has done, or for the fact that I can ask Him for anything at all? For one thing, Please is easy. Please is all about me: my needs, my pain, my worries, my fears. Let’s face it: what’s easier or more interesting than focusing on me? Please is the clarion call from a Laura-centric universe. Thank you — well, thank you is a whole ‘nother thing. 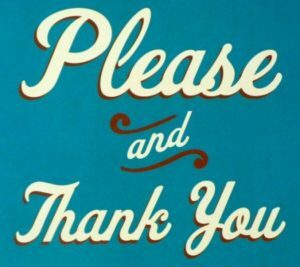 If Please is about me, then Thank You is about God. Thank You puts me in my (rightful) place in God’s universe — at His feet, under His power, in His debt. For someone who likes to live under the delusion that I am in control, that’s tough stuff. Thank You also raises the ugly specter that haunts every pray-er: unanswered prayer. Thank you acknowledges that the healing wasn’t a coincidence. It acknowledges that it wasn’t random. God acted and the diagnosis changed. God acted and the relationship was repaired. God acted and I had courage and strength where there had been fear and weakness. Yay! But once you say “Yay!” “Why?” isn’t far behind. Why did God act this time and not others? Why was this prayer answered and not others? These are uncomfortable questions, because honestly, we don’t know why. Not really. Sometimes in retrospect, we think we can see a good reason why our prayer wasn’t answered in the way we asked, and maybe we’re right. But more often, we really don’t know why God sees fit to heal some and not others. Some people look at that last sentence as prima facie evidence that God is either cruel and arbitrary, or doesn’t exist at all. And some believers look at that sentence and find it hard to be grateful to a God who doesn’t act predictably and in accordance with our desires. But Scripture tells us to give thanks at all times, in the “Yay!”, when it’s easy, and even in the “Why?”, when it’s not. Perhaps in those moments when we confront unanswered prayer, we can still give thanks for the privilege of prayer itself. When you think about it, it’s amazing that we can even approach the Creator of the Universe with our concerns, our pains, our joys and yes, our thanks. It is only because of His grace that, broken and imperfect as we are, we can come into the presence of such perfect love and power. This entry was posted in Christian Life, faith, prayer, thanksgiving and tagged gratitude, Laura LaSpalluto, prayer, prayer of thanksgiving by Laura LaSpalluto. Bookmark the permalink. “Yah” for excavating not only our neglect of thanks, but the deeper, troubling questions may be at the root of our neglect.